For the past twenty-five years or so I’ve made my annual pilgrimage to the International Bluegrass Music Association’s “World of Bluegrass” trade show which started out in 1988 in Owensboro, Kentucky, then moved to Louisville, then to Nashville, and then last year moved to Raleigh, North Carolina where the whole city became the venue. Attendance numbers exploded for the weekend “Wide Open Bluegrass Festival” with some estimates topping 200,000. I have no idea how many people were there in reality but the crowds were definitely impressive. I could tell I wasn’t in San Diego anymore. It’s hard to attract 200 to a bluegrass event in San Diego … although it happens from time to time. I do miss the good old days of Owensboro when the conference was smaller and it was possible to hang out in the hotel lobby with people like Earl Scruggs, Jimmy Martin and Doc Watson. But the excitement of Raleigh and the chance to reconnect with so many bluegrass music friends always makes the trip worthwhile. For seven years I co-produced the annual IBMA Awards Show which is held this year on Thursday night, October 2nd in Raleigh’s very impressive Performing Arts Center. I’m no longer involved in the production of the show but I look forward to it every year. This Sunday night on my radio program, I’ll be presenting music by all the nominees for awards (or at least as many as I can get into a two-hour show). If you are a fan of bluegrass music, IBMA is definitely something to put on your bucket list. I’m grateful I still get to go after all these years! 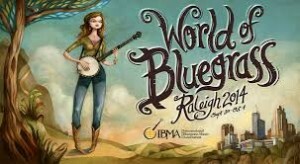 This entry was posted in Bluegrass, KSON's Bluegrass Special, Personal and tagged Bluegrass, IBMA, Raleigh. Bookmark the permalink.